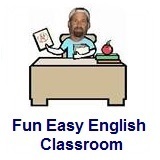 ﻿ Fun Easy English - new classroom free online classes english language lessons speaking listening writing reading october 31. Today in the Fun Easy English classroom you are going to take a little time away from formal English study and learn spelling and vocabulary using a Fun Easy English activity. Enjoy!!!! This is a fun way to learn new vocabulary every day. I am now planning a lesson for today and decided to include this activity until the new lesson is uploaded to this page. Crossword puzzles are a fantastic way to learn spelling and new vocabulary. This game has been around since at least the late 1800's and maybe even earlier.